Comforting to overloaded senses and delicate skin. 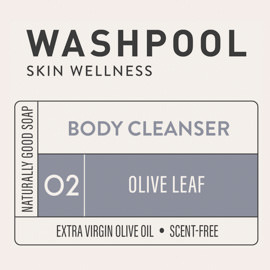 This range is unscented and made on pure extra virgin olive oil, and is suited to people with a range of allergies, sensitivities and skin 'problems'. What do we really mean by Sensitive Skin? ** If you are dairy intolerant you might want to avoid this goat's milk bar. Skin sensitivity could also be due to past or current exposure to harsh environments or substances that dry, irritate or inflame the skin. Look for simple ingredients that you can recognise in your products to reduce the chance of irritation. Sometimes skin sensitivity is simply about our stage of life. Babies and children definitely have sensitive skin and many of my clients have told me that as they age they find they can't use the same drying products they did when they were younger. Some people with sensitive skin react to scents, both artificial and natural, which is why this range is unscented, not even essential oils are added. 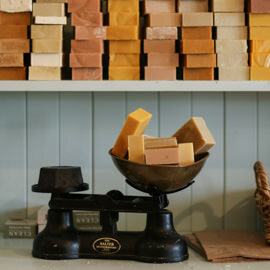 All of the soap bars in our Sensitive Skin range are made with Extra Virgin Olive Oil and NO OTHER OILS. 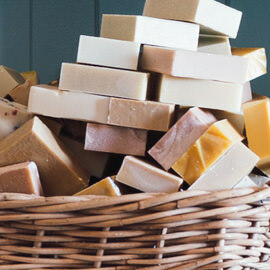 The lather of a pure olive oil (known as 'castile') soap is described as creamy or 'lotion like', which is exactly what you need when your skin is sensitive. And our promise to you? 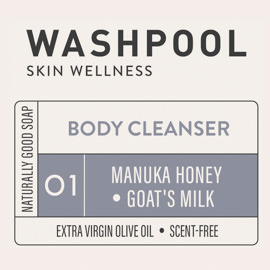 If you're not happy with the gentle cleansing effect of our Sensitive Skin Soap, simply return it to us and we'll happily refund the full price. Olive Oil (Extra Virgin) - We use food-grade extra virgin olive oil. Applied to the skin, it is helpful for dry skin, inflammation, wounds and burns. It is suitable for people with sensitive skin and babies and has excellent skin conditioning and emollient properties. Castor Oil - Castor oil comes from pressing the beans from castor bean plants. It acts as a humectant, which draws moisture to the skin and provides a protective barrier. It can be helpful for sunburn and other burns, skin irritation and inflammation. 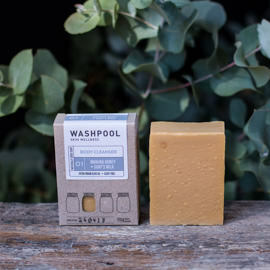 It helps with creating luxurious lathers. Shea butter - Shea butter is obtained from the nuts of the shea or karite tree in West Africa. It is helpful in moisturising and hydrating skin. Traditional african healers value it for it’s anti-aging and moisturising properties. Kaolin Clay - is a gentle clay with less liquid absorbing properties than other clays, which is helpful for sensitive and dry skin. Saponified Oils (olive, shea butter, castor), goat's milk, kaolin clay.